Samsung will host a press event next month, on June 12, and the company already confirmed that it would announce new tablets then. 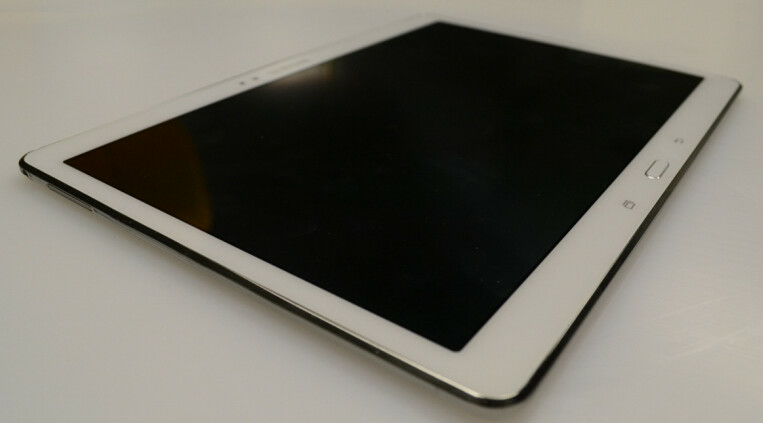 We’re expecting these tablets to be the Galaxy Tab S 10.5 (seen above) and Galaxy Tab S 8.4, both of which should feature AMOLED displays with 2,560 x 1,600 pixels. According to Finnish retailer Multitronic, the Galaxy Tab S 10.5 and Tab S 8.4 will be more expensive than the Galaxy Tab Pro 10.1 and Galaxy Tab Pro 8.4 (which were released earlier this year). We’ll remind you that a Galaxy Tab Pro 8.4 Wi-Fi currently costs around €350 in Europe, while a Galaxy Tab Pro 10.1 Wi-Fi can be bought for around €380. Of course, the Galaxy Tab S prices listed by the Finnish retailer haven’t been officially confirmed, so they may not be accurate. Still, it kind of makes sense for the new tablets to be more expensive than the Tab Pro slates, since it costs more to manufacture large AMOLED displays (instead of the LCD screens featured on the Tab Pro series). We'll bring more details on this as soon as we get them. Erm someone update me on how many tablets of similar sizes and specs with subtle differences have samsung released? Regrettably, no one in the right mind has the capacity to do that. An amOLED panel instead of a LCD is in no way a subtle difference. Think before you speak. You mean deeper blacks and wider color gamut? I will say this again and again and again, Amoled is overrated. LCD (super/iPS) doesn't exaggerate grays and shadows, plus it is ''generally'' accepted as a more natural color renderer. Amoled is better for reading texts, but punchier colors aren't everybody's liking....... NOTE 3 owner here, having used the Tab Pro 8.4 for 3 weeks now there's no way I'm buying another Amoled device, its black /contrast levels are simply impressive for an LCD screen. I agree as I am also a note 3 owner and have been using a Tab pro 8.4 for a couple of weeks. In comparing the two I prefer the more natural color displayed on the tablet. I've had phones with amoled screens since they've been out and would never get an LCD screen. It's much like LCD TV versus an LED TV, LED is far superior in color and blacks than LCD. Hands down amoled is superior to LCD. I've tried both and will never go back. It's not the technology, it's how the manufacturer chooses to calibrate it. AMOLED would destroy any kind of LCD display if Samsung wanted to market the display for natural viewing purposes. Because inherently, AMOLED has better blacks, better contrast and is brighter on lower brightness due to it being less reflective. Right now, Samsung calibrates their signature displays to come off as vivid because it's been wooing buyers, don't think for some reason, accurate OLED displays couldn't exist on mobiles. Just like how LCDs can look inaccurate or washed out, the.technology isn't inherently accurate it's just how companies like Apple calibrate them. HTC's M8 and Sony's Z2 that have S-LCD3 and IPS display respectively aren't accurate at all when it comes to displaying colors. Is that why the KE55S9C is considered to be best display available in the world? Read before you shout. You do know you could root your NOTE 3 and use a custom kernel to adjust the colors to your liking right? I didn't like the colors of my Galaxy Nexus so I just rooted, installed a custom rom and kernel and adjusted them. Problem solved. the tab pro 8.4 is an impressive device. the camera is more than decent. Got it for 424 USD on release day here in America....they charge a whole lot over there. Yea that's a pretty decent difference in price. I lucked up and caught the pro 8.4 on sale at best buy for $350. It worth for best tablelts of the year with best displays...Amoled..I can't wait any more sammy ...! Bring it on - the 8.4". My next Android tablet. Price doesn't justify for a sh*tty Amoled. They love to rip people off. I don't think u should call it sh!tty..if you hate samsung then ignore my comment and continue hating but if u r neutral to technology then I think u should also respect people's preference for vivid colors of amoled. For me, I like amoled because I prefer vivid color, deep blacks and how less it consumers power on latest version of Amoleds. I have a LG 22" LCD monitor and it has got options for natural and vivid mode. I use natural mode for reading text but when it comes to watching movies I prefer vivid. Similarly, I'm sure I would love amoled tablet to watch movies and photos. I am not a Samsung fan and Apple, HTC, Sony etc hater because I prefer AMOLED nor I am unknown to any of these technologies. By knowing the technology behind and my personal preference, I like amoled more than LCD. When it comes to my dad, he likes LCD more then AMOLED and I didn't tell him LCD is sh!tty..instead I suggested him to buy HTC m8 which he refused to buy at first due to brand unawareness in my country but later I assured him its a good product then he bought. For me I am waiting for note 4 and note pro series of tablet with AMOLED. Wow samsung! You're the best, an amoled tablet? Now we're talking, day one purchase. I copped a Tab Pro 12.2 on ebay for 475.00! Yessss! I can't wait to see what these bad boys look like in person. It reminds me of the day LCD tv's were replaced by LED tv's. I couldn't wait until I bought my first LED tv :) Amoled far superior to anything LCD...go samsung!!!!! When Samsung tells you something that doesn't automatically equate to "them" being right all the time. TAB pro should be expensive than the Tab S series.i mean specs on pro should be on S Series.